PracticeLink.com W INTER 2018 23 F I N A N C I A L F I T N E S S Exceptional Quality of Life united health services is the largest healthcare system and leading private employer in the Greater Binghamton region. As a locally owned, not-for-profit, 500-bed system, it serves over 350,000 residents in the Southern Tier of New York State and portions of Northeast Pennsylvania. We are a regional referral center for such medical specialties as cardiac surgery, neurosurgery, renal dialysis, neonatal intensive care, trauma care, reconstructive surgery, chemical dependency care and physical rehabilitation. Recruiting: Cardiology, Dermatology, Emergency Medicine, Family Medicine, Geriatrics, Hospitalist, Internal Medicine, Neurosurgeon, Nocturnist, Obstetrics/Gynecology, Orthopedics-Trauma, Otolaryngology, Physiatry, Psychiatry, Rheumatology, Surgery- Cardiothoracic, Surgery-Trauma, Urgent Care, Urology Contact: Lori Walling Physician Recruitment lori_walling@uhs.org (607) 763-6392 uhs.net/careers/physician-opportunities/ there, but still thought his decision to move down to a rural part of the state was a poor career move. "Here, you can make a good living and not have to answer to the huge bureaucracy that comes with being owned or employed by a hospital," Aguillon says. 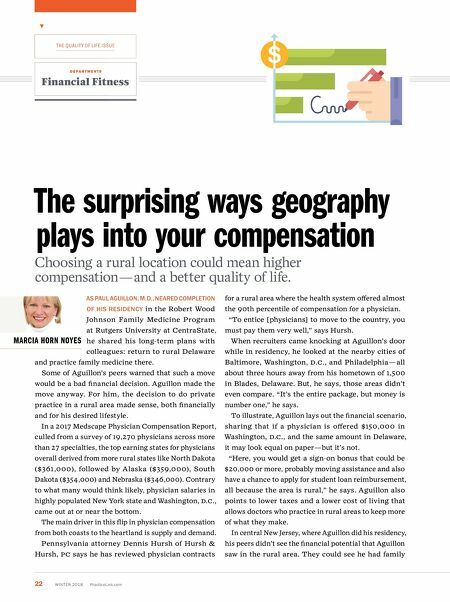 More than money In addition to a lower cost of living, many physicians who practice in rural areas find that the lifestyle plays a key factor in their overall compensation decision. Bruce Guyant, now director of provider growth and integration at Novant Health, used to recruit physicians to the West. He says, "Even though some physicians may be attracted to a specific position or location because they grew up there or have some tie or an affinity toward the area, others are attracted to the Rockies because of what the area has to offer by way of lifestyle, outdoor amenities, climbing, hiking, fly fishing, hunting and world-class ski venues." Guyant recently placed a family medicine physician in a small Utah town, two and a half hours away from Salt Lake City near the Colorado border. Although the physician did not grow up in or near the area where he now practices, he loves the red rocks of Utah and is an avid mountain biker and climber. "While other places may have paid him more or perhaps in some ways might have been a bit more competitive in terms of the position itself, our location won him over, even though we are hours from anything," says Guyant. 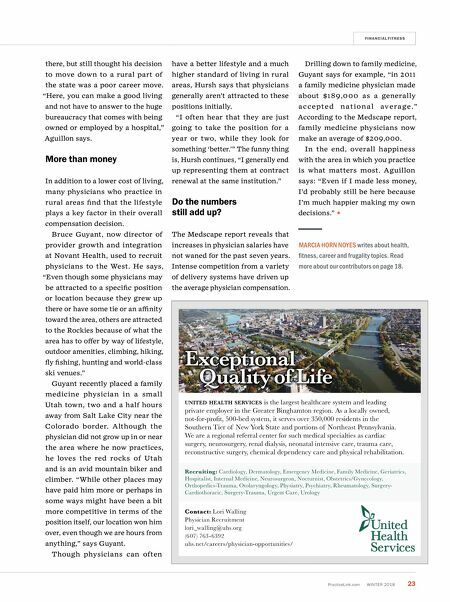 Though physicians can often have a better lifestyle and a much higher standard of living in rural areas, Hursh says that physicians generally aren't attracted to these positions initially. "I often hear that they are just going to take the position for a year or two, while they look for something 'better.'" The funny thing is, Hursh continues, "I generally end up representing them at contract renewal at the same institution." Do the numbers still add up? The Medscape report reveals that increases in physician salaries have not waned for the past seven years. Intense competition from a variety of delivery systems have driven up the average physician compensation. Drilling down to family medicine, Guyant says for example, "in 2011 a family medicine physician made about $189,000 as a generally a c c e p t e d n a t i o n a l av e r a ge ." According to the Medscape report, family medicine physicians now make an average of $209,000. In the end, overall happiness with the area in which you practice is what matters most. Aguillon says: "Even if I made less money, I'd probably still be here because I'm much happier making my own decisions." MARCIA HORN NOYES writes about health, fitness, career and frugality topics. Read more about our contributors on page 18.